For true railroad travel fans, just the thought of taking a trip on one of the legendary trains can create excitement. Get ready to be excited and step back in time to the golden age of railway travel. 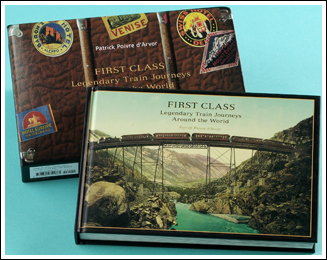 This enchanting book, designed to resemble a vintage steamer trunk, takes you on a magic journey on the Orient Express, the California Zephyr, the Trans-Siberian, Le Train Bleu and others. Along with the hundreds of color and sepia tone and b&w photos (trains, stations, posters), classic journeys are described in excerpts from great books and authors. Buy a ticket for this trip and enjoy the journey. 360 pages, 9” X 6-1/2”.